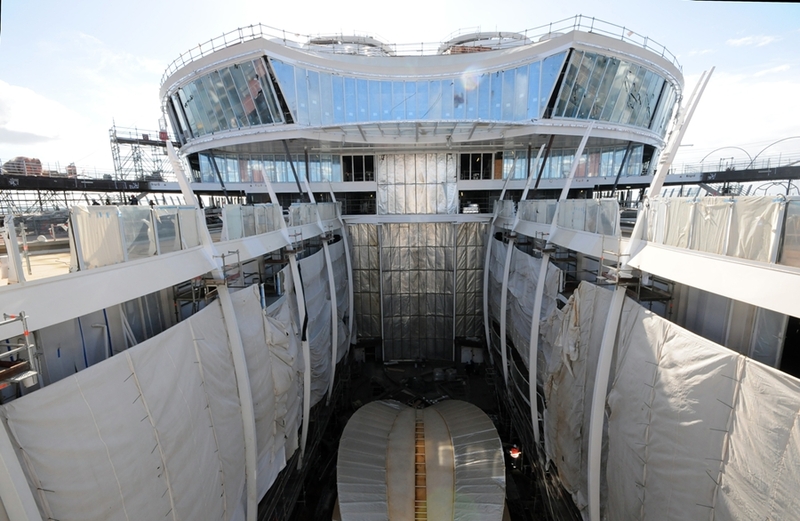 Construction is nearing completion on Harmony of the Seas, the latest mega cruise ship to join the Royal Caribbean International fleet in April 2016. 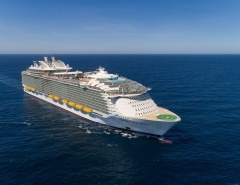 This Oasis class vessel is the biggest yet, hosting 5,479 passengers, almost 100 more than sister ships Oasis of the Seas and Allure of the Seas. 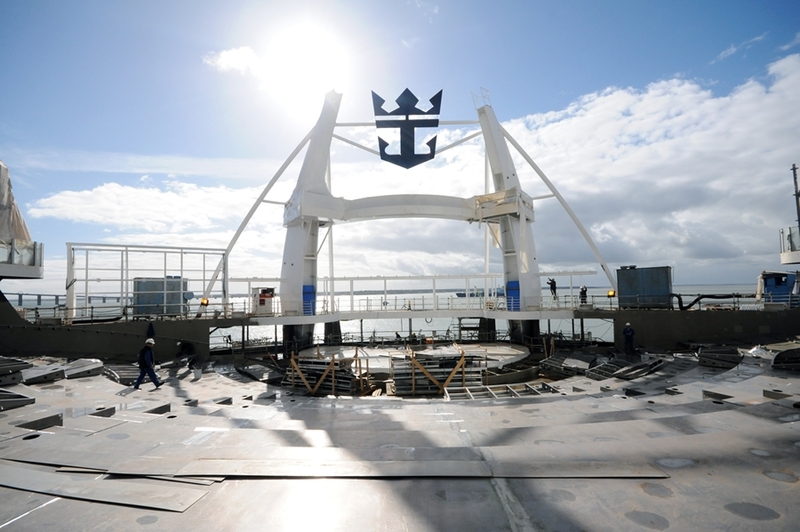 Royal Caribbean is leading the way in engineering and innovation of modern cruise ship design. 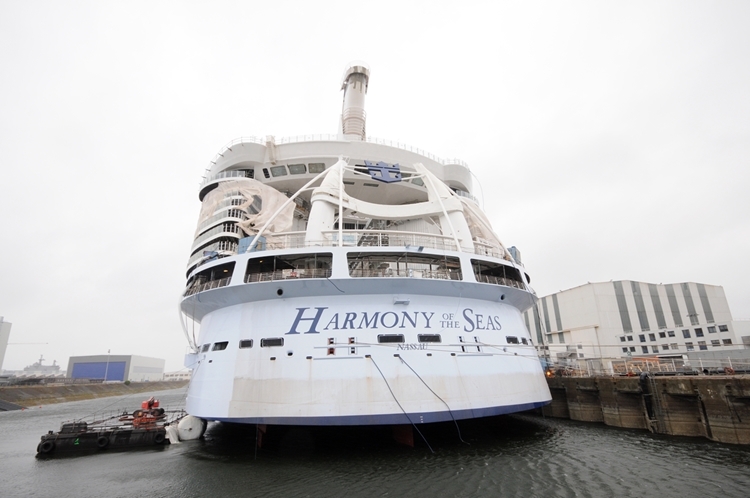 Harmony of the Seas aims to tick all the boxes in creating an entertainment and relaxation environment for cruisers who believe that bigger really is better. 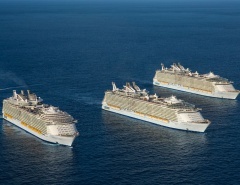 Not content to sit back and simply tread water, Royal Caribbean International has been expanding its fleet at a phenomenal rate during recent years. 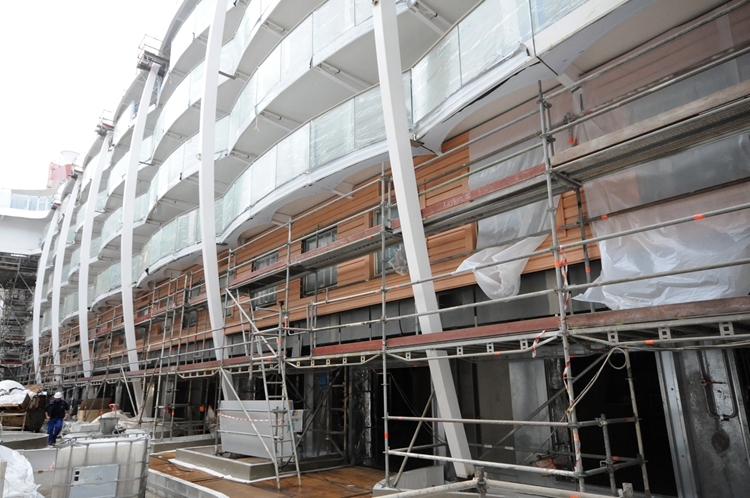 The revolution in cruise ship design and construction has been fuelled in no small part by an evolution in passenger expectations, with cruising becoming a first-choice vacation style for people of all ages and groups of all sizes. The sheer size of this mega-ship creates an opportunity to fully satisfy the desires of all passengers, with designated onboard ‘neighbourhoods’ being purpose built to provide the full gamut of cruising action and adventure. Hosting a population the size of a small town, including several thousand dedicated staff and crew, has created an opportunity like never before for onboard diversity. Harmony of the Seas introduces passengers to attractive ‘neighbourhoods’ where you can mix and mingle with like-minded people or simply explore all the ship has to offer. Central Park: While smaller cruise ships can seem insulated or isolated from the natural world, Harmony of the Seas brings nature along for the ride. Central Park is an expansive neighbourhood accented by around 12,000 trees and plants creating a green-space where you can stroll, shop or dine while appreciating the scent and sight of lush foliage. Royal Promenade: Here you will be excused for forgetting you are even on a cruise ship. The Royal Promenade is a Harmony focal point and meeting place where you can sample foodie delights, view extravagant parades and entertainments, or even sample a cocktail made by one of Royal Caribbean’s famous robot bartenders. Pool and Sports Zone: When you have had enough people watching and it’s time for action, the Pool and Sports Zone is the place to be. 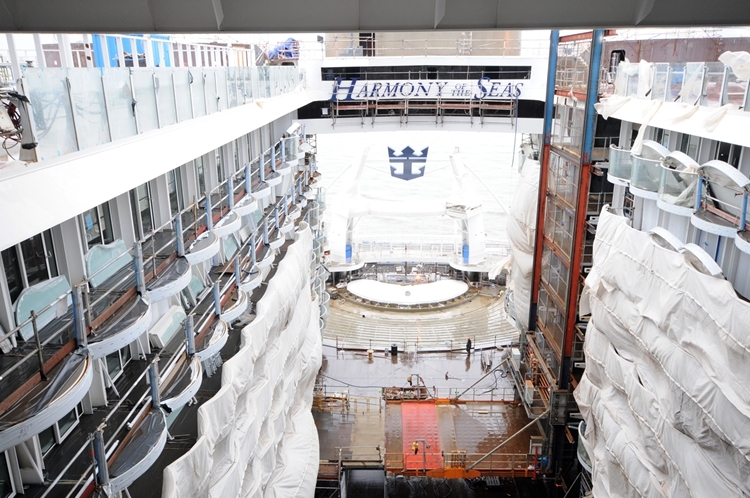 In a first for Royal Caribbean, Harmony of the Seas will have five giant water-slides plus a 10 story plunge. 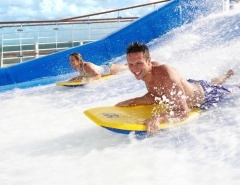 Other adventure activities include FlowRider surf simulators, zip lines at precarious heights and a rock climbing wall to keep your sea legs super fit. Boardwalk: Talk about nostalgia. The Boardwalk neighbourhood includes a full-size carousel complete with ornamental horses and all the trappings of yesteryear, in a modern setting. The kids will love it, along with the arcade and Aqua Theatre, where daredevils entertain passengers with high-dive spectaculars into the deepest pool on any cruise ship. Entertainment Place: Every cruise ship likes to transport passengers to a fantasy world of entertainment, and Harmony of the Seas is no exception. It’s time to get dressed up and experience the glitz and glamour of Broadway-style shows and music extravaganzas, or try your luck on one of the many gaming tables at Casino Royale. Dance the night away to live music and make new friends from around the world. Vitality Spa and Fitness: Recharge, relax, rewind or workout – the choice is yours. Vitality Spa and Fitness offers full-body treatments and services that will have you looking and feeling great, all within an expansive and inviting healthy neighbourhood. The only challenge is finding the balance between fitness, fun and feasting on Harmony of the Seas, but everything is here to encourage you to look your very best by the end of the voyage. 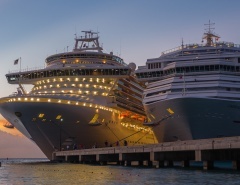 Youth Zone: Some cruise companies were slow on the uptake, but Royal Caribbean have long realised the needs and desires of teens, kids and babies. The Youth Zone neighbourhood is expansive enough to create entertainment and socialising regions that are age-specific, with trained staff on hand to supervise activities. The opportunity for older teens to hang out together in their own space is a real draw-card, as are the activities, contests and video games that are tailored to suit every age group. Dining choices are vast on Harmony of the Seas, and only passengers on longer voyages will have time to sample everything. There are ten free restaurants and eateries, including four main dining restaurants. Accommodations range from Studio Cabins to the two-deck-high Royal Loft Suite, and dozens of alternatives between the two, many with balconies. From bars and lounges, several pool choices, laid-back recreation, ongoing entertainment, cutting-edge technology, and the latest environmentally sustainable innovations, Harmony of the Seas delivers the goods. Harmony of the Seas couples the ‘wow’ factor with the latest performance innovations, and passengers are already booking ahead and ready to line up for an unforgettable onboard experience while cruising to exciting destinations. Launch date is fast approaching, and now is the ideal time to make an advance booking. Let me know if you know more about this magnificent cruise ship or found great photos of the construction!